For anyone trying to maintain a healthy weight, lose weight or gain muscle, a bathroom scale is a necessary tool. It seems simple enough to step on the scale and get a reading, but is that number accurate? There are a few factors that can cause discrepancies between your actual weight and the number displayed on the scale. The optimal surfaces for a bathroom scale to yield the best results include ceramic or porcelain tile, hard wood or concrete. Linoleum, vinyl, carpet, and other softer flooring can cause small variations in weight depending on how much cushion there is. EatSmart bathroom scales have four precision sensors. To maximize accuracy, these sensors need to be placed on a hard, flat surface. First, commit to weighing in on a consistent schedule, whether you weight in daily, bi-weekly, or weekly. Next, pick the same time of day to weigh in. Weighing in first thing in the morning one day and then right before bedtime the next day will not give you an accurate picture of your weight. This is because weight fluctuates 1 to 4 pounds throughout the day. When’s the best time to weigh in? Research shows weighing in first thing in the morning, before breakfast, will provide you with the most accurate read on your weight. Not a fan of keeping track of data? Our Taylor Bluetooth Body Fat Smart Scale wirelessly transfers the data from your scale to your phone or tablet, eliminating the need for you to keep track manually. In addition to your weight, this scale monitors body fat, muscle mass and body water. Anytime you move the scale (even sliding it out a few inches from underneath the counter), you must let it calibrate. This allows the scale to reset its internal parts and find the correct “zero” weight to ensure accurate readings. If the scale is moved and not recalibrated, it may cause fluctuations in readings. For the best results, step onto the scale, stand completely still and count to three. Three seconds is the ideal amount of time for the scale to obtain an accurate reading. Moving around and shifting your weight while standing on it, may cause inaccurate readings. Finding it hard to stand comfortably on your scale? Our Eatsmart Precision Plus Digital Bathroom Scale has a generously sized 15” platform that accommodates larger frames. As with any electronic product, prolonged use of your digital scale can cause some wear and tear. If you can’t remember when you bought your scale, it might be time to upgrade! 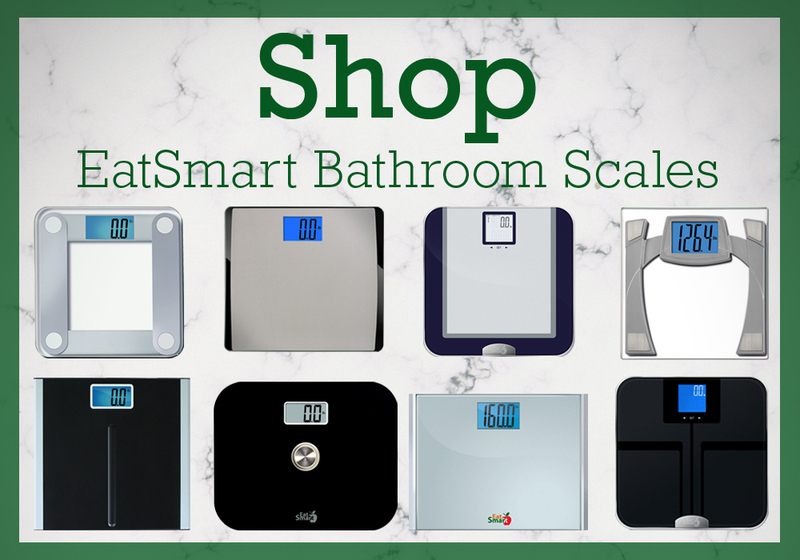 Our Eatsmart Precision Digital Bathroom Scale is easy to use and is ranked as the #1 best-selling scale on Amazon.com. All Eatsmart products come with a 2-year limited warranty. Maintaining consistency, with both weighing in and with scale placement, will help your scale do its job accurately. In turn, this enables you to have a true picture of your weight and health.